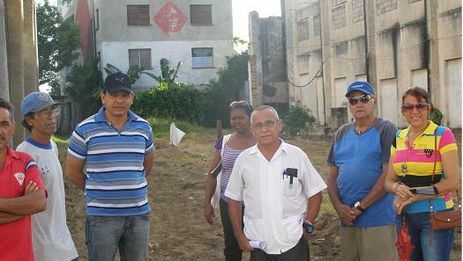 14ymedio, Pedro Armando Junco, Camagüey, 13 September 2016 — The struggle of a small community of neighbors in Camagüey against the allocation of a plot of land at the corner of their building to an official from the Ministry of the Interior, has resulted in a small victory, as they have managed to stop the work on the new owner’s house. Since 2001 there has been a plot of idle land some 200 yards from where it is believed the first house in the city was built, 500 years ago. As the area is large, and given the deterioration of an old multi-family building, at the end of the 1990s it was planned to fund new construction of a five-story building with 10 apartments. The new housing was planned to be built under the “microbrigade” progam, [Ed. note: See page 26 of the linked PDF] most of whose participants came from the deteriorating structure, and they were the ones doing the work. The project was completed and the new building was inhabited while the old building collapsed, leaving a generous plot of land in front with the new apartment building behind. For more than 15 years there have been many solicitations to build in the downtown area, but all were denied. Thereafter, the empty space has served only as an eventual landfill. The pleasant site to the east hosts the America Cinema, an emblematic theater from the 1950s, a beautiful and well used entertainment venue, and to the east Plaza Santa Ana hosts its namesake church, more than 300 years old, the oldest church on the city. In early August, to the surprise of the locals, it was announced at a neighborhood meeting that the vacant lot had been given to a high official of the Ministry of the Interior. Almost immediately, a supposedly qualified person marked off an extensive perimeter for the construction of a private residence for the official. Many members of the community criticized the “excessive” use of space – around 2,700 square feet – and there was even an exchange of angry words between a neighbor of the building and a family member of the official. The following day backloaders and trucks appeared to clear the area and excavate it, leaving only a few yards of space between the site and the multifamily building to the rear. There was no delay in registering a complaint. The building residents and some other people from the community got together and drafted a protest letter to the municipal government with more than 20 signatures. The district’s delegate to the People’s Power, affectionately called Angelito, offered his unconditional support to the citizen protest and said he felt badly for not having taking into account their opinions as the area’s authority from the Communist Party base. In the letter the residents argued that not only would the building completely eclipse the view of the beautiful multifamily building, whose brightly painted color scheme contributes to the atmosphere of this corner of the city, but the narrow corridor remaining for their circulation was dark and hidden and badly connected to the street. They also argued that in the case of a medical emergency, a fire, or any other emergency, it would be very difficult in such a narrow space for an ambulance to maneuver, much less, a fire truck. Dr. Armando Balaguer, promoter of the complaint, appeared before the president of the municipal government and, he says, he was not treated with the expected benevolence. The local president claimed that the Ministry of the Interior official, Liduvina Gay Perez, deserved the land donation because of her dedication as head of the women’s prison in Camagüey. Dr. Balaguer stressed that the demand of the neighbors was not opposed to the individual who was benefiting from the donation, it was simply a demand for the rights of the citizens in this small community of families, not only with the voice and legitimate vote of their delegate, but also because the more than 10 families affected includes five doctors, most of whom have served on international missions providing health care in other countries [in exchange for payments in cash or oil to the Cuban government]. In addition, although the land is state-owned, the residents of the building feel it is their own, and given their marked sense of belonging their demand states that they want a playground to be built there, or a circuit training park to fight obesity, or a fenced area for children’s sports, given that the neighborhood’s children do not currently have a place for extracurricular games. This first discussion was a failure. Without surrendering to defeat, Dr. Balaguer met with several residents of the building and with the delegate of the district, and they went again in a tight group for the second time to the office of the president of the municipal government. After some research on their own, they learned that the Office of the City Historian, the supreme entity in such cases, had not given its approval for the donation, which would indicate that the gift was directly rooted in the municipal government with the concurrence of the Department of Physical Planning. After the clearing of the land, the excavations, and the staking out of the perimeter, the work has been stopped. It is appears that the methods used to arrive at the construction of the house were not the most correct nor in accord with the aesthetic interests of the city.